You are here: Home>Tags>the last sheaf itself was called the cailleach or hag. the last sheaf itself was called the cailleach or hag. 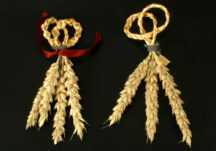 Harvest knots were a tradition in many places.